For her appearance at a recent event, Diana picked a dress by Jodi. Wearing her hair in messy side-braid, the actor finished out the look with earrings from Ritika Sachdeva and Fizzy Goblet jootis. The ‘DeBo’ look works for Ms. Penty; she looked nice. While at a Mumbai college to promote her upcoming movie, Jacqueline was photographed in a printed Hemant and Nandita dress. Wearing her hair down, the actor finished out the look with jutis from Fizzy Goblet. Easy and fuss-free, it was a look that worked for Ms. Fernandez. Of course, she could’ve stepped up the debo vibe with a stack of chunky silver cuffs and/or bangles but the look worked as is too; Jacqueline looked nice. Newly weds Bipasha and Karan made an appearance at the Iftar party hosted by Baba Siddique with the former wearing a pink Dolly J sharara (or is that a lehenga?) and the latter in a white kurta and churidaar. P.S. Bipasha’s jewellery is from Mahesh Notandas and jootis are from Fizzy Goblet. Kareena and Arjun visited the sets of a TV show for Ki and Ka promotions. 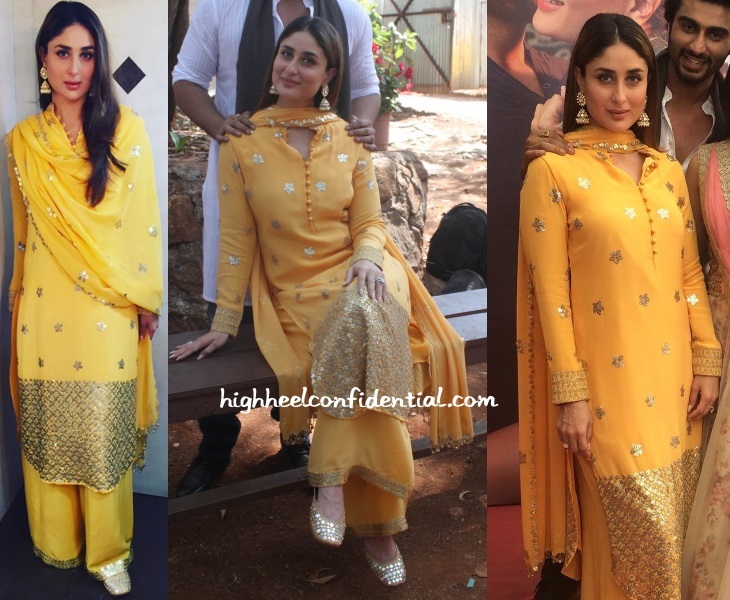 For the taping, Kareena sported a cheery Anushka Khanna suit with jootis from Fizzy Goblet and jhumkis from Krsala.